FEED A: Indie Horror Done Right! 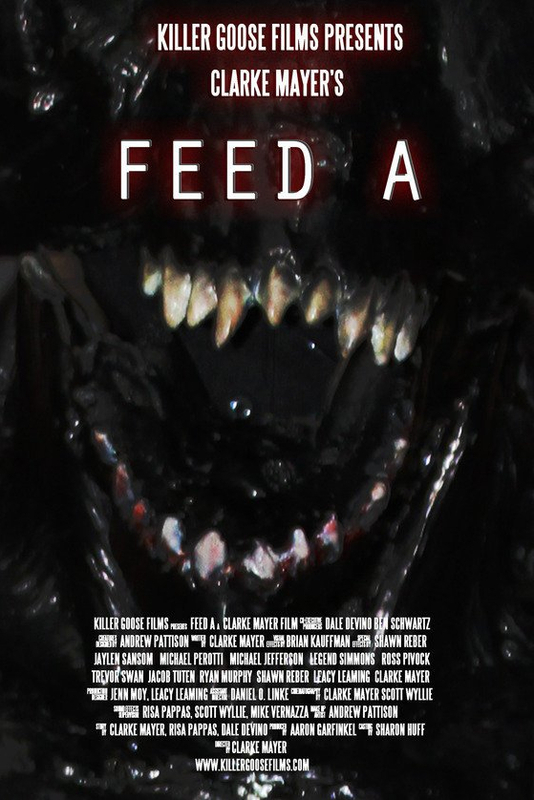 FEED A follows a SWAT team investigating a disturbance in a suburban home, which soon turns deadly with the arrival of an otherworldly creature. Told from the perspective of an unseen cameraman, every single movement is perfectly choreographed, most every effect is practical, and the entire film feels firmly grounded in reality. Although the film is written and directed by Clarke Mayer, it can also be viewed as a truly collaborative effort made by New Jersey-based production house Killer Goose Films. If the current indie movement really is the “new” New Hollywood, then Killer Goose is emerging as the equivalent of what United Artists was in the early 1970’s: a hub of creative filmmakers wearing different hats and all working on one another’s projects. So aside from just being a good movie, what makes FEED A relevant to the indie scene? Mostly because it exemplified how much strategy is involved at this level of filmmaking. When you hear that this film was shot in just two nights, most of the story occurring in real time, and edited together with only about six or seven cuts, you’d think this was a quickie gig. So many filmmakers are lured in by the temptation of making a movie they can shoot in a few days, cut together in a week, and then throw the result out on YouTube. Instead the film required quite a bit of planning before its two nights of shooting in December 2010 and several more months of post production. The result is one of the most compelling and layered sound mixes you’ll ever hear on an independently-produced film. After fifteen months of post work, plus being swamped with other projects, Mayer finally returned to the film, completing the final cut in March of 2012. But he adamantly refused to put the short film on YouTube or make it available to everyone. This was a film that needed to be experienced, and so he wisely found a way to build word of mouth. That summer he began a Kickstarter campaign to raise distribution funds. But again, whereas many Kickstarer/Indiegogo campaigns are rushed out, this one was also planned months in advance. First off, he had a major advantage: instead of the standard “We really wanna make a movie. Please give us money and we’ll try to make one,” the campaign instead said “Look, the movie’s already made and you can watch it if you want. What we need is for you to help to let the rest of the world see it!” Second, whereas other campaigns have pitch videos of a person simply talking to the camera, which isn’t very compelling, this pitch video was a well-produced short film in itself that may be viewed here. In an homage to B-movie trailers of the 1950’s, Mayer gives a tip of the hat to Rod Serling, telling us about FEED A. Within less than a minute of starting the video, I knew the campaign would be a success. When you can tickle a person’s funny bone, you’ve made them want to help you. The campaign did more than just raise funds; it served as a marketing tool for this unique horror film that you just couldn’t see anywhere…yet. With the funding now in place, Mayer embarked on targeting the right film festivals, and in August of 2012, FEED A finally premiered before an audience on a big screen in the dark…the way it was MEANT to be seen. FEED A has since been accepted to The Pollygrind Film Festival of Las Vegas, Carnival of Darkness 3 in Los Angeles, The Arizona Underground Film Festival, Chicago International REEL Shorts, and many chapters of the H.P. Lovecraft Film Festival in different cities, among others. It was also nominated for “Best Action Sequence” – Short, and “Best Sound Design” – Short at the Action on Film Festival in Monrovia, CA. Finally, it played as part of NewFilmmakers, NY’s screening series allowing it to be screened at one of New York’s most historic venues, Anthology Film Archives, where I finally saw the film. And there are several more screenings and festival runs in the works! Stay tuned to Killer Goose Films’ website or right here to G. Rod Buzz to learn about them as they are announced. Meanwhile, Killer Goose is hard at work on various new projects while Mayer is building a resume as a professional cinematographer. Some of his work may be seen below. And as for the film itself, FEED A is historic on many levels. Yes, it’s good when just evaluated as a horror/thriller/sci-fi story. It’s good just from a filmmaking perspective where you marvel at the technique. But it’s also an emblem for the new model of indie film production and distribution. FEED A goes against the fast-shlock and YouTube mentality of putting out content, instead taking a high road of grand filmmaking. Diehard horror fans will love it, and aspiring filmmakers should take notes on what Killer Goose is up to. Oh yeah, and did I mention it’s also the best “found footage” movie ever made? Isn’t this just [rec] ? The premise is similar, but I feel the execution of FEED A is superior as it is smaller-scale and feels more grounded in reality.